Pictured are Ron Wroblewski and Amy Santos. 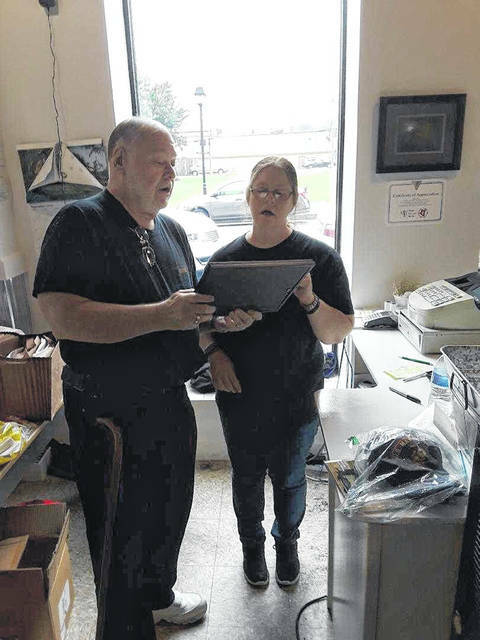 GALLIPOLIS — Vietnam Veterans of America, Tri-State Chapter 949 announces Zack and Scotty’s restaurant in Gallipolis was presented two”‘Certificates of Appreciation” for their support of veterans in the Gallipolis area. The certificates were presented by Vietnam Veterans of America, Tri-State Chapter 949 and the West Virginia Marine Corps Coordinating Council President Ron Wroblewski on Sept. 27. Every Fourth of July they prepare and donate the food for a public dinner at VFW Post 4464 and award the proceeds to the Post. Throughout the year Zack and Scotty’s are involved in fund raisers for veteran organizations. Also, in 2017 they raised over $6,000 for babies addicted to drugs. “Stop in and say hello to Amy and Scotty and check out their Wall of Heroes where all veterans are welcome to display their picture,” a press release from the Vietnam Veterans of America, Tri-State Chapter 949 stated. Zack and Scotty’s restaurant opened in Gallipolis in June 2018. They were previously located in Rio Grande, Ohio the past seven years. All veterans receive a discount. Submitted by Vietnam Veterans of America, Tri-State Chapter 949.